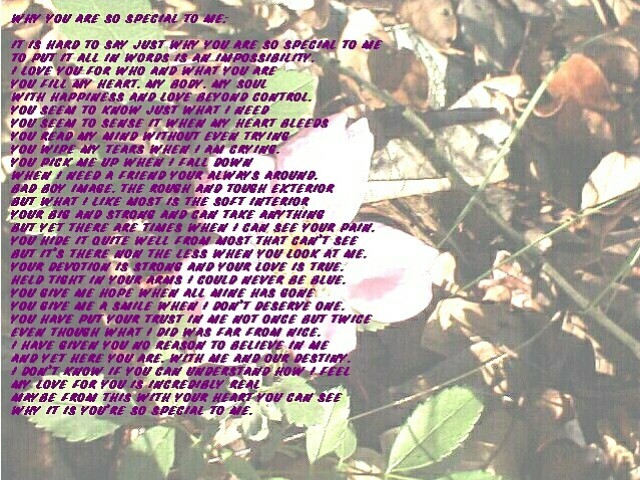 This poem was written just for The sweetest man I know. He asked me one day just what it was about him that was so special and I was at a loss for words at that time other than the usual. It is sometimes very difficult to put your feelings into words. Myself, this is one of the best ways I know of to let people know what I am thinking and feeling. I hope that this poem wxplains to him just what he means to me. I love him with all my heart and soul. To me there is no other man alive that could ever take his place in my life or heart. I hope to add more work like this to my site soon, so keep watching!!! !